The male model in the distance isn’t called Richard. The female model at the front of this image isn’t called Karen. We cannot comment on their songwriting abilities either. Image by Guru XOX (via Shutterstock). At this time of writing, we are a week away from the last Bank Holiday till Christmas. 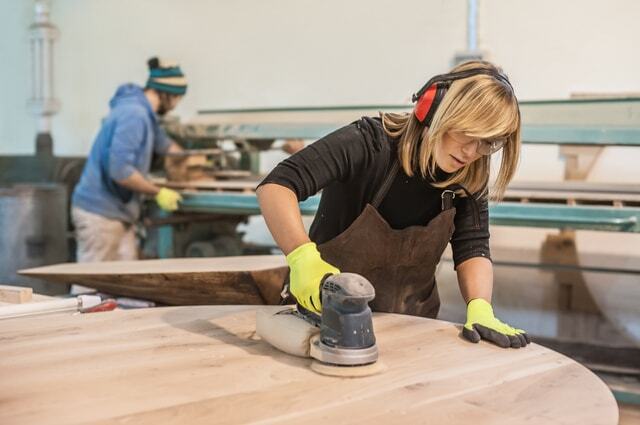 A traditionally busy time of the year for timber merchants and DIY stores. For many people who are not making their way to Blackpool, Llandudno or Southport, this is a time for carpentry and joinery. A time to undertake a minor project you put off on Friday. Or a major one you have put off since the summer holidays. If you are stuck for inspiration, our selection of carpentry themed video clips could fire your enthusiasm. With a weekend to play with, you could hone your carpentry skills on making two single beds. Team Plumstead’s six and a half minute clip shows you how. Paul Sellers’ clip shows you how to make a dining room chair. If you’re entertaining guests over the Bank Holiday weekend, this carpentry clip is for you. Naftali Rosenthal’s video looks at how you can add a dining table to your chair (or set of chairs). To round off our selection of carpentry clips, we turn to the late great Kenny Everett for inspiration. On his comedy shows throughout the 1980s, he had various characters like Captain Kremmen, Sid Snot, and Cupid Stunt. In later episodes, one of his best characters was the accident prone DIY enthusiast, Reg Prescott.